The canadian two disc special edition is loaded with extras as you can see below and the second part is as full, but they cost me more than 30$ each when I got them in the store. I think Pete got these for cheap, so that's why he has this release. Now that is a special edition! Acclaimed star Richard Dreyfuss gives the performance of a lifetime (1995 Academy Award™ Nominee, Best Actor—Mr. Holland's Opus) in this uplifting hit cheered by audiences everywhere! Glenn Holland (Dreyfuss) is a passionate musician who dreams of composing one truly memorable piece of music. But reality intrudes when he reluctantly accepts a "day job" as a high school music teacher to support his family. In time, however, Mr. Holland realizes that his real passion is teaching, and his legacy is the generations of young people he inspires. Also featuring Glenne Headly (2 Days In The Valley) and Olympia Dukakis (Mafia!) — you're sure to find this electrifying motion picture both entertaining... and unforgettable! As most of you know... I am not a fan of music in general. And if that is not enough I never liked Richard Dreyfuss. So you must understand that I was more then concerned about enjoying this movie. Thankfully this isn't actually a musical. More of a drama that just happens to be about music. So that was definitely a plus for me. As for Richard Dryfuss... I am still not a fan., He just kinda bugs me whenever I see him on the screen. I don't know why. It is something I know is irrational... but it is what it is. So his presence was no help for me what so ever. But it is a good story about a teacher and how much he cared for his students and teaching them what he loves so much. I especially enjoyed the storyline of his relationship with his son. It showed he wasn't a perfect person. And I felt it helped balance the character. It is a good movie that is definitely worth watching... even if it is a little on the long side. Thanks... and yeah I even think it would have gotten a bit of a higher rating if Dreyfuss wasn't in it. I know that isn't fair but he does take a bit of the enjoyment away for me. Well done, Pete! Although not a musical (otherwise I wouldn't have liked it) it is about the essence of music. One of my favourite moments was when he taught his students about classical, by demonstrating how rock music was using the same melodies. Fantastic. But I think your rating is spot on. It is over-long and a bit melodramatic, so whereas you may have an irrational anti-Dreyfuss thing going on let alone your difficulty with music, your conclusion is realistic and a fair assessment for anyone interested in seeing it. I'm not interested in sport in general, but I can easily watch a sports film, because I do respect people who show a passion and intelligence for what they do, and we can learn a lot from that. Perhaps you got the same from this. Thanks Jon... and yes that is what I got from this one. You were able to easily say what I couldn't put into words for some reason. The Death of the Incredible Hulk is the fascinating finale of the hugely popular TV series about a scientist, Dr. David Banner (Bill Bixby), who transforms into a mighty, larger-than-life beast called the Hulk (Lou Ferrigno) when he gets angry. Desperately trying to rid himself of his monster-like alter ego once and for all, Banner sneaks into a government research lab run by Dr. Ronald Pratt (Phillip Sterling), hoping to find a solution. When Pratt discovers Banner's plight, he offers to help. But a beautiful spy (Barbara Tarbuck), who's out to steal Pratt's ideas for terrorists, forces Banner to choose between love and loyalty, good and evil, and ultimately, life and death. I decided to watch this one today (January 22) because today is Bill Bixby's birthday. He would have been 77 today. This one has to be my least favorite of the reunion movies. But wanted to watch it because it is all I had left to watch in the Incredible Hulk Marathon thread. I still did enjoy it... it just wasn't quite as enjoyable as the first two movies. Unlike the first two there was no other guess superhero. And I just found parts of the storyline to be a little too slow. This is the only reunion movie that didn't have Jack McGee chasing after stories of the Hulk. Apparently they couldn't get Jack Colvin to appear for one reason or another. I keep going back and forth on how I would have wanted the story to end. David finding a cure or finding death. But in the end I think they went the right way. Academy Award®-nominated stars Joaquin Phoenix (Best Supporting Actor, Gladiator, 2000) and John Travolta (Best Actor, Pulp Fiction, 1994) ignite the intense action in this heroic tale of ordinary men with uncommon courage! As part of a tightly knit brotherhood of skilled firefighters, Jack Morrison (Phoenix) grows from inexperienced rookie to seasoned veteran as he faces a dangerous job that makes him a hero to strangers but often shortchanges his wife (Jacinda Barrett – The Human Stain) and kids. Then, when he becomes trapped in the worst blaze of his career, the things Jack holds most important – family, duty, courage – come sharply into focus. I been wanting to fit this one in for a while now... as I have enjoyed firefighting movies in the past. I have to say... it has been a while since I watched any other movies about firefighting... so I have a hard time comparing it to any of the others. But I enjoyed every second of this movie! It has lots of great firefighting action in it as well as a good story of their private lives that keeps you just as interested as all the action sequences. I normally don't care much for flashbacks in movies... but this movie did it right. They were done so well that during the scenes that took place in the present I was looking forward to the next flashback to learn more about this brave firefighter's life. I think I personally would have preferred the movie to end differently. It is still a powerful ending... I would just rather have seen it be different. Either way... this is definitely a movie I would recommend. 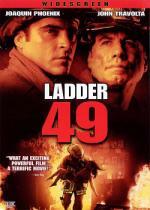 I loved Ladder 49. Better than Backdraft IMO. Backdraft... Thank You! that is the one I was trying to remember. I haven't seen it in years. I may have to see if I can get that one on DVD here soon! I remember very little about that movie really... but I do remember enjoying it at the time. "Alien" is the first movie of one of the most popular sagas in science fiction history, and introduces Sigourney Weaver as Ripley, the iron-willed woman destined to battle the galaxy's ultimate creature. The terror begins when the crew of the spaceship Nostromo investigates a transmission from a desolate planet and makes a horrifying discovery -- a life form that breeds within a human host. Now the crew must fight not only for its own survival, but for the survival of all mankind. Looking at my list of movies to watch I see that somehow I haven't watched this movie since 2004. Could that be right? Has it really been 7 years since I seen this movie? Well that is what DVD Profiler tells me so I guess so. Anyway... I thought I need to fix that problem here today. I am not sure what I can say about this movie that hasn't already been said... so I will keep this short and sweet. If you are a sci-fi fan... a horror fan... or both... in my opinion this movie is a must see. It is just a well done movie... it keeps you glued to your seat watching... even after multiple viewings. I couldn't recommend this movie high enough! Awesome. One of my all time favourites. And just think, Pete, in 2004 you wouldn't have given this 5 stars! I don't know... this one could very well have been an exception to the rule.